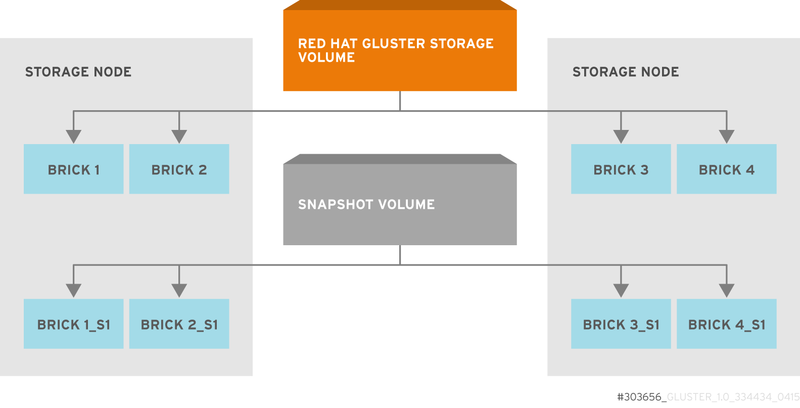 Red Hat Gluster Storage Snapshot feature enables you to create point-in-time copies of Red Hat Gluster Storage volumes, which you can use to protect data. Users can directly access Snapshot copies which are read-only to recover from accidental deletion, corruption, or modification of the data. In the Snapshot Architecture diagram, Red Hat Gluster Storage volume consists of multiple bricks (Brick1 Brick2 etc) which is spread across one or more nodes and each brick is made up of independent thin Logical Volumes (LV). When a snapshot of a volume is taken, it takes the snapshot of the LV and creates another brick. Brick1_s1 is an identical image of Brick1. Similarly, identical images of each brick is created and these newly created bricks combine together to form a snapshot volume. A crash consistent snapshot is captured at a particular point-in-time. When a crash consistent snapshot is restored, the data is identical as it was at the time of taking a snapshot. Currently, application level consistency is not supported. Snapshot is an online snapshot hence the file system and its associated data continue to be available for the clients even while the snapshot is being taken. The quorum feature ensures that the volume is in a good condition while the bricks are down. If any brick that is down for a n way replication, where n <= 2 , quorum is not met. In a n-way replication where n >= 3, quorum is met when m bricks are up, where m >= (n/2 +1) where n is odd and m >= n/2 and the first brick is up where n is even. If quorum is not met snapshot creation fails. To guarantee crash consistency some of the fops are blocked during a snapshot operation. These fops are blocked till the snapshot is complete. All other fops is passed through. There is a default time-out of 2 minutes, within that time if snapshot is not complete then these fops are unbarriered. If the barrier is unbarriered before the snapshot is complete then the snapshot operation fails. This is to ensure that the snapshot is in a consistent state. Taking a snapshot of a Red Hat Gluster Storage volume that is hosting the Virtual Machine Images is not recommended. Taking a Hypervisor assisted snapshot of a virtual machine would be more suitable in this use case. Each brick must be independent thinly provisioned logical volume(LV). The logical volume which contains the brick must not contain any data other than the brick. For each volume brick, create a dedicated thin pool that contains the brick of the volume and its (thin) brick snapshots. With the current thin-p design, avoid placing the bricks of different Red Hat Gluster Storage volumes in the same thin pool, as this reduces the performance of snapshot operations, such as snapshot delete, on other unrelated volumes. The recommended pool metadata size is 0.1% of the thin pool size for a chunk size of 256KB or larger. In special cases, where we recommend a chunk size less than 256KB, use a pool metadata size of 0.5% of thin pool size. To create a brick from device /dev/sda1. Create a physical volume(PV) by using the pvcreate command. A thin pool of size 1 TB is created, using a chunksize of 256 KB. Maximum pool metadata size of 16 G is used. Create a file system (XFS) on this. Use the recommended options to create the XFS file system on the thin LV. Mount this logical volume and use the mount path as the brick.